Adrian Menendez-Maceiras (ESP) d. (6)Inigo Cervantes (ESP) 7-5 3-6 4-1 ret. Adrian Menendez-Maceiras (ESP) d. Filip Krajinovic (SRB) 4-0 ret. Tennis news updates once a week. Special offers on tennis gear. We will never share your email. 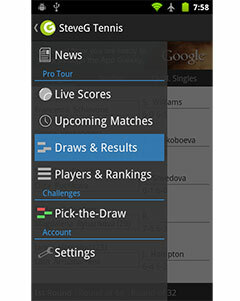 Play our draw sheet challenge games available in our free tennis App, that also has tennis news and live scores... Grab it now! Search & We’ll Find It..
©2013 STEVEGTENNIS.COM - All 3rd party trademarks are hereby acknowledged.